Momo grey black seat covers enhances the look of your car interior. 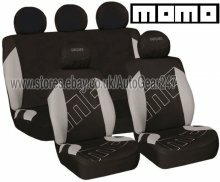 This special set includes front and rear seat covers, 5 head rest covers. Compatible with seats with integrated airbag. Will these Fit My Car?? Please note this item is classed as a universal fit, therefore no exact application or suitability guide is available..If not suitable we offer full refund under our 14 days return policy. Universal fit seat cover means they will be suitable for most standard and average size seats. Since seats folds and lifts in different ways in every model, the seat covers do not come with fitting instructions. If not sure, your local garage or dealer may be able to advice and assist.